1 A None No Power Seat 1 A may have restricted legroom. The position of the bassinet and proximity to the lavatory may be bothersome. 1 C None No Power Seat 1 C may have restricted legroom. The position of the bassinet and proximity to the lavatory may be bothersome. 1 D None No Power Seat 1 D may have restricted legroom. The position of the bassinet and proximity to the lavatory may be bothersome. 1 F None No Power Seat 1 F may have restricted legroom. The position of the bassinet and proximity to the lavatory may be bothersome. 10 A None No Power Seat 10 A is a standard Economy seat that Air France designates as Seat Plus. This seat has extra legroom. An extra surcharge may be required to book this seat. 10 B None No Power Seat 10 B is a standard Economy seat that Air France designates as Seat Plus. This seat has extra legroom. An extra surcharge may be required to book this seat. 10 C None No Power Seat 10 C is a standard Economy seat that Air France designates as Seat Plus. This seat has extra legroom. An extra surcharge may be required to book this seat. 10 D None No Power Seat 10 D is a standard Economy seat that Air France designates as Seat Plus. This seat has extra legroom. An extra surcharge may be required to book this seat. 10 E None No Power Seat 10 E is a standard Economy seat that Air France designates as Seat Plus. This seat has extra legroom. An extra surcharge may be required to book this seat. 10 F None No Power Seat 10 F is a standard Economy seat that Air France designates as Seat Plus. This seat has extra legroom. An extra surcharge may be required to book this seat. 22 C None No Power Seat 22 C is a standard Economy seat. 23 C None No Power Seat 23 C is a standard Economy seat. 24 D None No Power Seat 24 D is in the last row. This seat may have no recline. The proximity to the lavatory may be bothersome. 24 E None No Power Seat 24 E is in the last row. This seat may have no recline. The proximity to the lavatory may be bothersome. 24 F None No Power Seat 24 F is in the last row. This seat may have no recline. The proximity to the lavatory may be bothersome. 25 C None No Power Seat 25 C is a standard Economy seat however, the proximity to the lavatory may be bothersome. Other flyers tend to bump into this seat. 26 A None No Power Seat 26 A is in the last row and is missing a window. This seat may have no recline and is missing a window. The proximity to the lavatory and galley may be bothersome. 26 B None No Power Seat 26 B is in the last row. This seat may have no recline. The proximity to the lavatory and galley may be bothersome. 6 A None No Power Seat 6 A is a standard Business seat. 6 F None No Power Seat 6 F is a standard Business seat. 8 E None No Power Seat 8 E is a standard Economy seat. 9 A None No Power Seat 9 A may have limited recline. 9 B None No Power Seat 9 B may have limited recline. 9 C None No Power Seat 9 C may have limited recline. 9 D None No Power Seat 9 D may have limited recline. 9 E None No Power Seat 9 E may have limited recline. 9 F None No Power Seat 9 F may have limited recline. This version of Air France's A319 has 143 seats and is flown in a 2 class configuration. The aircraft features European-style Business Class and Economy Class seating. Horrible seat. Limited leg room compared to the rest of the economy class due to curtains plus business class in front. There is no window at row 26. I travelled from Paris to Istanbul which was a 3 hour flight. The distance with the front seat was very small and obviously the seating plan was not done for people taller than 1.75m. But I think it is tolerable for a short flight. I was so glad that I didn't buy a business class ticket because business class was exactly the same with economy class, but only difference was the middle seat was empty. It was already empty on the row i was sitting and at least it gave me more space for my legs. It was not a comfortable plane, but it was ok when the flight duration and the price (which was reasonable) were considered. There is minimal room for anyone in economy on this plane. Very tight seating for me at 5ft8. Fortunately it was only a 90 minute flight from Venice to Paris. AF does not allow you to get a seat assignment until check-in on this plane. I checked in promptly around the opening of the check-in period and was able to get an aisle seat. 17C was bearable thanks to the aisle. Anyone flying into Paris needs to be aware France has instituted high security protocols, which means all passengers disembarking are funneled to customs/immigration for a passport check and must then again stand in line at customs immigration for another passport check when boarding your connecting flight. So allow plenty of layover time if you are connecting. It took 40 minutes from time of exiting this AF flight to reach the gate of my connecting AF flight. None of the regular economy seats are designed for tall people with long legs. I am 6'2'' (186 cm) and my legs are pressing against the front seat (11D). If the guy in front reclines, there is absolutely no room for anything. 6F was an economy seat on this flight, just one row behind the so-called Business Class seats which are exactly the same as the other seats. It was the most horrible inflight experience ever and I am a VERY frequent flyer in the top tier. It would be better called a "seat-ette." The seat are shorter from front to back, do not recline, and the armrest was so short and tiny that I was unable to rest my forearm on it; it rather took up limited space. I am very short (5'3") and my knees hit the seat in front of me. The seats are so narrow that my legs touched the legs of the passenger next to me and neither of us was overweight. After sitting for 3 hours, I felt as if I had been in a torture chamber. i fly 125,000 miles a year and this was the most horrid experience ever. Unfortunately, I have other trips scheduled on this medieval torture chamber and cannot avoid a repeat experience. It does not appear that any other seat is any more comfortable. Airplane looks as if it were designed for Barbie and Ken. There was no way I could have gotten out of my seat to use the lavatory. The airplane has 3-3 seating, but on aircraft of this size, some airlines use 3-2 seating. 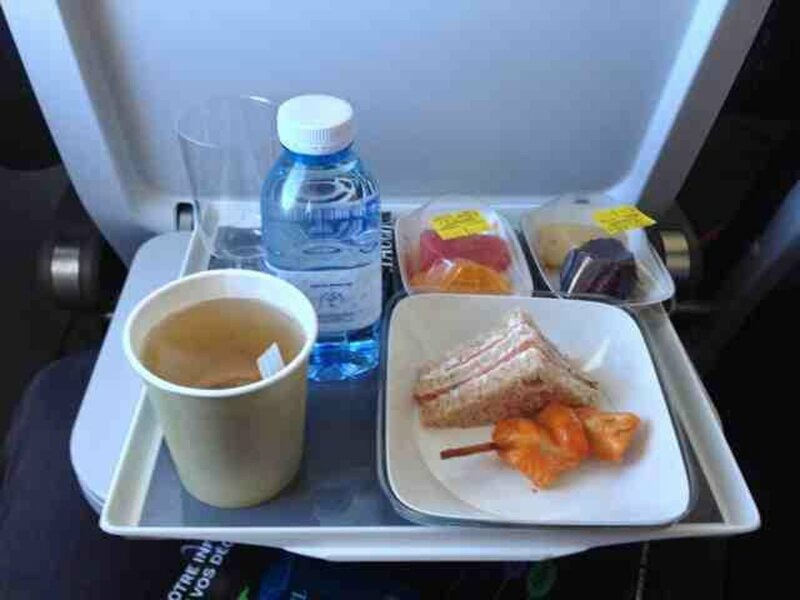 This was sold as a business class seat but it is a standard economy class with a meal. I had insufficient legroom and an uncomfortable flight. The business class seat pitch is not 33 inches as noted, but more like 30 inches. At 6'4" I could not fit into the business class seat pitch. I've had better economy seats than the high priced business class seat I purchased. The width of the seat is fine, but for business class airfare, I would expect a minimal amount of comfort, to say the least. I had to stick my legs in the aisle to stretch them. Needless to say, I won't fly AF again unless I have no other choice. This Airbus feels more like a bus and less like an airline. Felt really jammed in our seats in economy and I'm short (5'2"). I wasn't happy that our seats wouldn't be assigned until we checked in. The computer automatically assigned us to row 10, but then when we went to board the plane we got pulled aside becuase they said my 9-yr-old daughter couldn't sit in that row (exit row). But then they said they couldn't rearrange both our seats together becuase the flight was full. But they moved my daughter one row back, and to the opposite side, and told me it was the best they could do. But the onboard attendants would help us switch with someone. I explained the situation to the on board attendants as we got and they wanted nothing to do with helping us. When I started asking another passenger to switch seats, one attendant got swooped in to look like they were helping, I guess.Terrible service. No recline. Could barely open magazine when person in front reclined. Passengers allowed to line up 5 at a time for toilet further limiting personal space. Was not allowed to choose seat at check in. Horrible. Air France flies 2 versions of Airbus A319.